One more winter is slowly getting over again, I must say this one was quite shorter for me due to Australia trip. I was used to fly lots also in winter time, but this year snow and bad weather came also more to Nova Gorica and flying is not as good as it was for last three years since I am living here. I took my time to trim the glider back from Australia hot 50°c. There have been some bad attempts :) but at least I know now I have the glider totally ready for Winter race that is coming here, I hope, next week. Many people are asking me about what organizers will decide but it will all come down to a decision tomorrow on Thursday. I would not like to stand in their shoes as the forecast is changing every few hours. Fingers crossed it all comes down to another decent race here in Vipava valley. This will be a tight schedule this month with two races, another one in Bassano Del Grappa, the traditional Easter competition in Italy. I refused to pay for the competition in advance as last year they forced two days in rain to have a valid comp while I gambled a bit too much at home and lost the whole entry fee that is really expensive in Bassano. Alan was in contact with them about refunding at least a bit of entry fee. Two answered mails and they where gone from this planet. Let us see how will they deal with that this year. Yesterday we had an interesting day to fly. It finally turned to the west with stronger wind predicted but as we came to the landing it was all covered with high clouds already. We know how much ridge racing can W wind predict here so we knew it all should work out. 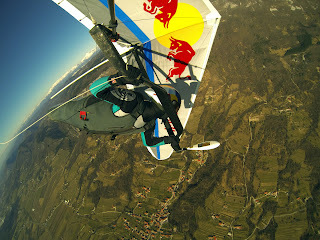 We got up to climbs of 7 m/s, Davide was at 2100 m at Nanos see the picture here. I chaged my gps UTC settings after Australia to +2h which is incorrect at the moment here :) so my time to leave for work came one hour earlier than it could but still one hour of nice flying in strong conditions. Glider felt superb. You will get all the news from both competitions here as I will be blogging with my Nokia of course.